"Dear Evan, and the staff, Thank you for all your help on our wedding day. The food was excellent, the effort you put in was very much appreciated." 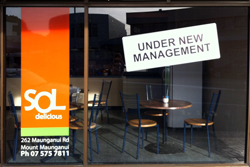 As well as our regular catering services, Food Gurus also operates SOL Delicious, a cafe in Mount Maunganui. Located at 262 Maunganui Road, you can find us just opposite the Bay City Cinema, which is just a short walk from the main shopping street in Mount Maunganui. We took over what was previously the SOL Shack (and Mainstreet Cafe before that) in May 2012, rechristened it SOL Delicious and immediately set to work revamping the look and - more importantly - the menu to bring it up to our usual standard. great coffee by Fusion Coffee. We're open from 7am-3pm Monday to Friday and 7am-3pm Saturdays. Our phone number is 07-575 7811 if you want to call ahead to book a table!